When I was a kid, I wouldn't eat grits. The name was just too weird for me; it conjured up visions of eating gritty dirt or sand. Back then, I didn't know that grits are just ground up hominy...which is just corn. "Grits" means coarsely-ground meal. You may not be familiar with grits. In the U.S., they are a Southern staple. Grits originated with Native Americans, and are similar to other thick, maize-based porridges from around the world such as polenta or farina. Most commonly thought of as a breakfast food, they are eaten as a hot cereal-type dish. I'm glad to say they also make delicious muffins. These muffins are slightly sweet; they're nice and moist, and have a flavor and texture similar to cornbread. Grits muffins are enjoyably chewy- not tough at all, but what you might call hearty. If you were talking about pasta, you'd use the term al dente. Serve these muffins at any meal. They'd be good at a brunch with eggs and sausage, or in the evening with beans, soup, goulash- just about anything. 1. Preheat oven to 400 degrees. Spray a 12 cup muffin pan with nonstick baking spray. 2. In a large bowl, combine flour, grits, baking powder, baking soda, and salt; whisk well to combine. 3. In a medium bowl, combine sour cream, butter, honey, and eggs; whisk well to combine. 4. Pour egg mixture into flour mixture. Stir until just moistened. You may have some small lumps in the batter, but don't over-mix or the muffins will be tough. 5. Divide batter evenly among the muffin cups, and bake until golden, about 15 minutes. 6. Let muffins cool in pan for 5 minutes. Remove from pan, and let cool on wire rack. Serve with butter and honey, if desired. Grits Muffins may have been taken to some of these fun parties! They sound delicious and yes food is a big part of family history. Yum! I was in the South for the first time recently and a commercial came on the TV about Grits at McDonalds. I was like they sell Grits at McDonalds??? Good Post! I have had grits once in my life and they were NOT like this delicious looking muffin! Great recipe. Thank you for your comment on my blog today! Hope to see you this week on Foodie Friends Friday! I'm a Southerner but have never had grits in a muffin but I'm definitely making these - they look heavenly! I have everything I need to make these awesome muffins, I can't wait. Have a great St. Patrick's Day and thank you so much for sharing with Full Plate Thursday! Miz Helen, I hope you enjoy them as much as we did! :) Happy St. Patrick's Day to you and yours! Now this looks like a version of grits I could eat! Thanks so much for linking up at my Real Family Fun link party! Have a great week...I hope to see you again next week. KC, thanks for coming by....I love the Real Family Fun party! Thanks for stopping, Cindy! I am looking forward to visiting your blog! Just bookmarked this - it sounds great! Thanks for linking up to Friday Food Frenzy! I wanted to let you know that I featured this in my "What I Bookmarked This Week" post on Saturday. Stop by and see! 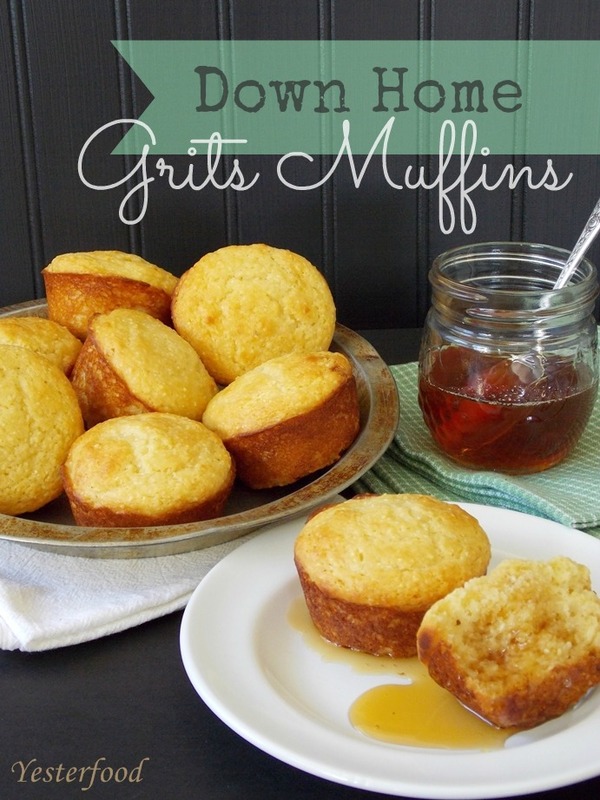 My husband LOVES grits, so I am definitely going to have to try these out! Pinned them for later! Leia, I hope he enjoys these as much as we do! :) Thank you so much for coming by! I love grits and could eat it every day. Never have had it in muffins, but boy do I want to! Thank you for linking with See Ya in the Gumbo this week! Thank you so much, Ruthie, and thanks for coming by! I'll see you next week! These muffins sound delicious. I must confess I didn't realise grits were just cornmeal...I always hesitated to try them as I wasn't sure about them. I'm also not very good with porridge-like textures but I like cornmeal, so these muffins are the perfect solution and a great way for me to try grits :) Have a lovely week! April, I was leery, too, but these muffins won me over! :) I'm so happy you came by...always wonderful to hear from you! I hope you have a wonderful week as well! Yummm! This is definitely something I would love to eat! :) Thanks for linking up at Sweet & Savoury Sundays! OMG! I love grits, and these sound delicious! Jeni, thank you so much- they are really good! :) I'm so glad you came by- thanks!! I've never thought to put grits in my muffins before! LOVE it! I would love these muffins! One would not be enough. Thanks for sharing on Thursdays Treasures. Christie, you are absolutely right- I have found that it is impossible to eat just one of these. :) Thank you for coming by, and thanks for hosting a great party! The only time I ever had grits was when they were mushing and in a bowl! I think I would love these muffins though! I love the drizzle of honey! Thank you for sharing at the In and Out of the Kitchen link party. I look forward to seeing what you bring next week! I'm a southern girl and have never had Grit Muffins, but can't wait to!!! I'm so glad you shared with us at Real Housemoms for Fabulous Fridays!!! Thanks for linking this recipe to Saturday Dishes. I will be featuring you this Saturday when we link up Spring Dessert recipes. Savannah, thank you so much- how exciting! :) I appreciate it! I featured you today. You know those pics are so perfect it looks like magazine photos! And the recipe and all, it's truly a perfect post, absolutely beautiful! Connie, thank you SO much! I needed this today! :) Thanks so much for the feature, and for the kind words! Hi Joy! Thank you for sharing your recipe at the Weekend Kitchen Link Party! I'm happy to share that it's been featured! I look forward to seeing what you link up this weekend! I don't know that I ever make the same corn muffing twice, so I am excited to try grits as another variation! BTW your muffins look so pretty! Well, YUM! Living in the Pacific Northwest, there aren't very many of us who are familiar with grits---but we think we're being awfully Southern by making cornbread with our meatless chili! Ha! Thanks so much for linking up with our Make Bake Create Party! You really helped make our first week a great success! I am sharing my recipe for Fresh Strawberry Cream Torte at my Homemaking Party and would love to have you come join the fun. Being from Vermont, I have never tried grits before but these muffins certainly sound delicious! Just made these and they are delicious! I left out the sugar and added dried onions and red pepper flakes. Very moist and quite savory. Thanks for sharing something near and dear to my southern heart! Well, bless your sweet heart, as my grandmother would say! :) I am so happy you tried them and liked them. Tanya, I LOVE your idea of making a savory grits muffin- genius! Thank you for coming by and telling me how they turned out! Really delish. Subbed 1 c oat milk for the sour cream, as well as home-rendered lard for the butter to make this non-dairy. I did notice these definitely do not bake in 15 minutes, though - 20-25 minutes for sure til they were golden brown and cooked on the inside.